One of the common tactics of a domestic abuser is to lie. After all, he is of his father the devil who lies whenever he speaks. So it is the abuser’s nature to lie. And one of the ways abusers lie is to lie about the facts. About reality. To distort what happened. The goal? To convince the victim that her perceptions cannot be trusted. That she is crazy. A kind of fog is cast over the victim’s mind so that she wonders if what she saw or heard or smelled or felt was even real. 1Jn 3:8-10 Whoever makes a practice of sinning is of the devil, for the devil has been sinning from the beginning. The reason the Son of God appeared was to destroy the works of the devil. (9) No one born of God makes a practice of sinning, for God’s seed abides in him, and he cannot keep on sinning because he has been born of God. (10) By this it is evident who are the children of God, and who are the children of the devil: whoever does not practice righteousness is not of God, nor is the one who does not love his brother. There is nothing foggy about John’s words here. His meaning is clear. A Christian does not walk in sin. It is not his habit or practice. He is a new creation. This very thing happened to me when I was in seminary. I pointed these verses out to a professor and asked if they did not contradict what he had just been teaching us in class. His response was “Well, John was the apostle of black and white. But not all of the New Testament writers were.” Two years later that professor abandoned his wife and children and took off with a woman he was counseling. If you will start trusting yourself, read God’s Word as it is written, and stop filtering it through the lens of the all the false traditions we have so often been taught, you will find that YOU are in fact able to read and understand the Bible! And I think you just might be rather surprised at what you discover it to be saying, particularly about your abuser. No, it turns out, he is not a Christian at all. Out of curiosity, how many sins would generally be permissible? I mean this as a genuine question because I really don’t know. I think the abused have very tender consciences and many of us really fret over our sinfulness and wish we were much closer to perfection than we really are. Is swearing probably 5 times a week, on average, considered “a practice of sinning”? Or no? I wish it was zero, but it’s not. Sometimes, it’s more. It’s shameful, I know. No Name- This is a very good question. Thank you. Your concern about your own sin is shared by everyone who is a true Christian. The number of times actually is not the fundamental issue. The real point is “what do I do when I do sin?” The Apostle Paul says in Romans 8 and in Galatians 5 that every single genuine Christian is “led” by the Holy Spirit. The Spirit is in us, leading, illuminating, sanctifying. And that is why when you sin, you not only know it, you grieve over it. The wicked counterfeit “Christian” on the other hand does not grieve over his sin, he does not truly repent of it. The Spirit is not present in him. And in fact he is defined as a person by his sinful flesh. That is who he is. Sin is his DNA, just as his father the devil. He may pretend and often does. He may offer false repentances. But his practice is to sin because sin erupts from his sinful heart. That is not you, correct? So be encouraged and go right on fighting the battle we all fight. Put to death the deeds of the flesh by the Spirit. Thank you for such a nice reply. That puts things to ease. Whew! Something about the “practice of sinning” in 1Jn 3:9 really trips me up. Ah yes, that reminds me, “the Holy Spirit convicts whereas the devil condemns” serves its purpose here. Thank you Jeff for your affirmations. I’ve been struggling with cussing. I want to stop. I have a tender conscious— I’m comforted to know a concern for godliness and a desire to be “righteous” in private when no ones watching is a sign of true conversion. My abuser and his allies do not have a conscious at all. They profess Christianity, teach bible classes and lead worship but are false converts to the core. Their non repentant gang bullying and support of my abuser stand as proof. The following remarks are Paraphrased from the Psalms—can’t recall chapter and verse. The wicked are shameless. They gather together to defeat the righteous, but their swords will be driven into their own hearts. (We must take heart he is working on our behalf) Their weapons will be broken. God himself vindicates the righteous and their vindication comes from him— please lord may it come quickly for all of us. Let us see your goodness in the land of the living. Maybe this would help – Foul language, cursing, swearing is what I call the language of the flesh. It is the verbal expression of the remnants of sin still in us. So why should we let the flesh speak? It wants to talk. It makes us feel like WE want to say those things but in fact as new creations in Christ, we do not desire to do so. We want to use our mouths to express love to God and love to other people. And to speak God’s truth, even when that speaking involves confronting evil. I find it interesting that the vocabulary of the flesh consists of words (not very many of them actually) that in any human language are quite the same: stinking things, gross things, shocking and revolting things, and of course blasphemies against the Lord. And so, by the Spirit we put to death that old language of the flesh. But it is a battle for sure. I’ve just started getting your blog posts and am listening to your sermon series on domestic violence. I have been blessed tremendously by the teachings. I’m curious to know how did you get involved with learning and teaching about dv and the tactics of abusers. Thank you Mindy. Basically it was from being targeted myself as a pastor by these kind of abusers in the church. Eventually through research I discovered domestic abusers use the same tactics. 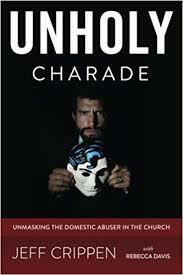 Most of the wicked ones who crave power in the church are also domestic abusers. If they will target a pastor they will target anybody. The wicked are shameless. Ps Crippen, Your text from John 3 has always been worrisome for me. I’ve always tended to see myself in stark black and white, looking deeply in the mirror and seeing the dirt and grime that is still on my face. The loss of control in traffic, the lack of love for spouses and children, the inability to do ANYTHING free of selfish ambition. My honest assessment is that I am and continue to be a sinner, lost if not for God’s mercy. As a young Christian (I’m now over 65 years old and perhaps should know better by now), I was all too ready to wrap myself up in the blanket of what Dr. Bonnhoefer labeled “cheap grace”–I’m saved by Christ’s historical and finished work on my behalf, in spite of my sin and my pretty spotty sanctification. But even now in my advanced years, I still must admit to a strong tendency to see my spiritual glass as half full, which means that when I read passages like John 3, there is an immediate niggling fear in my soul that I’m exactly what John describes. The reason I mention this is because I think this is a very big reason why abusers have such “success” in church circles. They expertly play on the idea that their targets are precisely the people John describes–as disciples of The Accuser, they expertly access that fear and manipulate it to result in precisely the behavior they seek from us: our inability to forgive them, for example, is proof of this. Propelled by the horror that we are no better than he that accuses, we redouble our efforts to show them (and ourselves) that we are capable of loving well and responsive to the spirit’s urging. This guilt and shame are the mainspring of the abuser’s engine. This is where they get their power over many Christians. When I used to deal with my own encounter with Satan’s lies (I don’t deal in any way anymore) it’s hard to remember in the moment that there is a difference between the Spirit’s gentle conviction and Satan’s accusations. That’s why your special place in the kingdom is so very important. You help us remember who it is who saves and why we are protected in spite of what Our/The Tormentor says. Q – thank you! Yes, the abuser wickedly uses our own thinking against us. He lies and accuses. He will accuse us, for instance, of unforgiveness when we refuse to yield to his false repentance, fake apologies, and our genuine and righteous desire for justice. The evil man loves to play on these things, perverting them, and then accusing, guilting, and shaming. I could give you countless examples I have experienced in these 35 years as a pastor dealing with spiritual and domestic abusers hiding in the church pews. The worst of them operated in our church for over 20 years before we really fully came to understand what he was doing in secret, by innuendo, by evil implication, and accusations guised in Bible verses. Ultimately we unveiled his evil to him and to our entire church and expelled him from among us. If you have not read David Needham’s book Birthright: Christian, Do You Know Who You Are? then I highly recommend it. That book dispels many of the false teachings we have been handed over the years. Needham drew a lot of heat from traditionalists when his book was published. It is excellent. One of the most freeing posts I ever read from Pastor Crippen was that the abusers were not Christian, they do not have the favor of God, that God is not in their side, and most importantly, unless they repent which is unlikely, I will not have to stand next to them in heaven. Since they are evil liars that manipulate people and circumstances to further their true fathers kingdom they delight in the lie that God is on their side. Because the church stands with them against the true victim, the victim feels that God himself is against her. I felt that pain during the many prayerful sleepless nights. Thank God I’m free and thank God for you Pastor Crippen— thank you So much. I am eternally grateful. .